Complete point spread betting overview. What is betting the spread? Learn why spread betting is sometimes better than the money line. Read my advice and betting tips for beginners. Reference tables list the best websites for football and basketball ATS trends. Bet is made on expected score difference. Bettor decides if underdog will win adding point spread to underdog’s final score. Or bettor decides if favorite will win subtracting point spread from favorite’s final score. Bettor reviews point spread. Juice is -110 unless otherwise specified. Bettor decides whether favorite or underdog will win. Favorites win if final score minus spread is greater than underdog’s score. Underdogs win if final score plus spread is greater than favorite’s score. Bet ties if underdog’s score plus spread equals favorite’s score. Popular straight bet. Sportsbook wants a balanced betting market. It will adjust spread and juice values to encourage betting on one side more than the other. Sportsbooks may offer ½ point spreads. This means tie bets are not possible. Taking the Favorite: Round ½ point spread up to the nearest integer. 2½ rounds up to 3. This is the favorite’s winning margin. The favorite must win by 3 or more points. Taking the Underdog: Round ½ point spread down to the nearest integer. 2½ rounds down to 2. This is the underdog’s losing margin. The underdog must lose by 2 or less points or win outright. Point spread betting is most common in football and basketball. Hockey puck lines are always -1½. Puck line odds vary with probability of favorite winning by 2 goals. SB3’s article “How to Read NFL Odds” discusses how to read betting odds in detail. Bettor chooses favorite Chicago Bears to win by 2½. Juice is -115. Bettor lays $115 to win $100. Bettor chooses underdog Orlando Magic. They cannot lose by more than 6. Favorite juice -108 corresponds to underdog juice -102. Bettor lays $102 to win $100. The following explains how spread bets win, lose or tie. Fictional scores have been given to our football and basketball games from above. Chicago wins game straight up 23-20. Bet wins if favorite score minus spread is greater than underdog’s score. Chicago 23 – 2½ = 20½. 20½ is greater than 20. Chicago covers spread. Bettor collects $115 risked + $100 win = $215. A tie is impossible because the sportsbook’s spread was 2½. The final score could never be Chicago 22½ – 20 Miami. This bet only can only win or lose. Bet wins if underdog score plus spread is greater than favorite’s score. Orlando 110 + 6 = 116. 116 is greater than 115. Orlando covers spread. Bettor collects $102 risked + $100 win = $202. A tie is possible because the sportsbook’s spread was 6. Suppose the final score was Cleveland 118-112 Orlando. Orlando 112 + 6 = 118. 118 equals Cleveland 118. The spread is tied. Neither Cleveland nor Orlando cover. Bet is graded “No Action”. A $102 Orlando bet would be refunded. Point Spreads are available for Football, Basketball, Hockey, Soccer and Baseball. Most sportsbooks will have lines for top leagues in the USA, Canada and Europe. Can be less expensive than betting the money line. It’s harder to make a bad bet at +100 to -120 odds. Some money lines cost -250 or more. Point Spread Betting rewards accuracy. Bettor doesn’t have to pick straight up winner. The spread levels the playing field between two unevenly matched teams. Spread betting juice is usually less than other bets. -110 is most common. Spread betting isn’t always the best value. A small underdog could win outright. In this case, a successful money line bet would pay more than a spread bet. Point spreads subject to change as betting market evolves. Your bet’s value will vary with these numbers. Carefully monitor line changes. Taking the public favorite offers limited value. Sportsbooks profit most from these wagers. Consider betting the favorite in other ways. Analyze current football and basketball ATS Trends and Stats. See our table below for a complete list of websites with NFL, NCAAF, NBA and NCAAB data. Compare numbers to find value. Shop spread and juice numbers at different sportsbooks. One sportsbook may have a better spread. Another may charge less juice. Shop lines to avoid ties when spread is a key number. See NFL and NBA key numbers below. Ties unnecessarily lockup bankroll. Example: Suppose Book 1 has an NFL underdog +7 -108. Book 2 has the same underdog +7.5 -110. Book 2’s bet is more expensive but less likely to tie. It’s a better opportunity. Fade public favorites against the spread. Use this website to track betting activity. Bet the favorite against the spread when the money line is too expensive. Money line bets > -220 may not be a good value. Be wary of road favorites. Never discount an underdog’s homefield advantage. According to Covers.com data, some 51% road favorites won ATS vs. 52% home favorites. Make sure you have good reasons for taking these teams besides their favored status. Buy ½ points to avoid ties (push bets) only if you can remain profitable. Sometimes the increased juice is not worth the risk. Half points typically cost another 10 cents with some exceptions for lines crossing key numbers. These purchases may cost up to 25 cents. Teaser Bet – Use the Teaser Bet to move spread and total lines in your favor. Buy points in exchange for a lower payout. Pleaser Bet – Use the Pleaser Bet to move the spread in the sportsbook’s favor in exchange for a higher payout. Parlay Bet – Combine multiple spread bets. All bets must win ATS for the parlay to win. See sportsbook’s parlay card to calculate potential payout. If Bet Win Only – Make multiple spread bets when you only have money for one. Next bet sees action if previous one wins. Reverse Bet – A double action If Bet. Make multiple spread bets when you only have money for one. Next one sees action if previous one wins, ties or is cancelled for any reason. College Basketball 1st half correlated parlay – Look for large spread to small total ratio. 25% correlation is ideal. Read more here. Football correlated parlays are rare and most sportsbooks prohibit them. Prof. Charles Kline McNeil created point spread betting combining ideas from other bookmakers. He later popularized it in Chicago during the early 1940s. McNeil completed a master’s degree at the University of Chicago, later teaching in New York and Connecticut. He was both an avid and successful gambler, eventually opening his own bookmaking shop in the 1940s. His bold decision was the result of another bookie limiting his action. McNeil’s spread betting invention changed the way people gambled on sports. 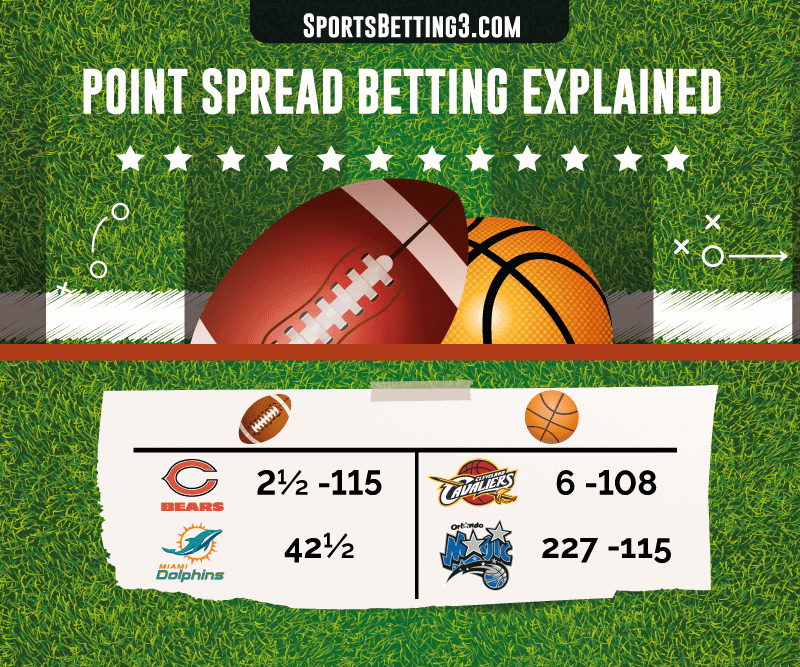 Spread bets are placed on the expected difference in score. This concept contrasted with money line betting. These bets are placed on the probability of a result. Prof. McNeil’s ingenuity is responsible for one of the most important sports gambling concepts in history. Point Spreads became common fare at Las Vegas and New Jersey sports books coinciding with the rise of large scale gambling operations in the late 1960s and early 1970s. Today all sportsbook operations – both onshore and offshore – offer spread betting. Hockey Puck Lines, MLB Run Lines and Soccer Goal Lines work like spread bets. Favorites win if final score minus 2 is greater than underdog’s score. Underdogs win if final score plus 2 is greater than favorite’s score. There are no ties unless bet is graded no action. Moneyline odds are assigned to each team’s line. Puck Line, Run Line, and Goal Line bets are considered secondary to moneyline bets. These lines often take longer to post than game moneylines. 3rd party odds tables provide most expensive line value. Calculation is for opposite line.